Animal Tissues. Nervous: spinal ganglia. Atlas of Plant and Animal Histology. 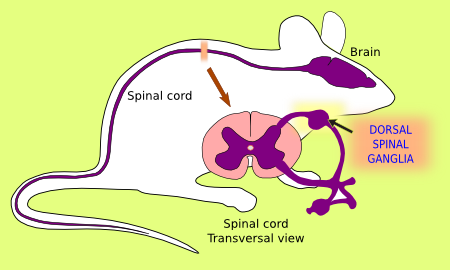 The image is from the spinal ganglia. Cursor over de the pig to see where the image comes from. Technique: silver impregnation, paraffin embedding. Sensory neurons are found in dorsal root ganglia. These cells have very large cell bodies that give rise to very long cell processes. In the root ganglia, there are also satellite cells intermingled among ganglion cells. Satellite cells are glial cells with large cell membrane expansions wrapped around nerve fibers. 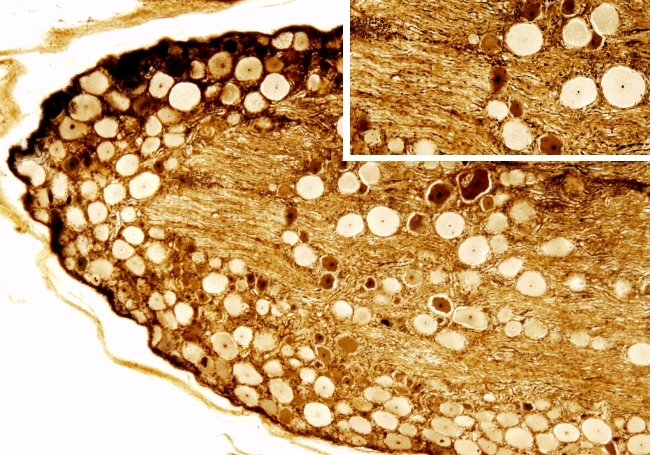 Many layers of cell membrane around one axons are known as myelin. Ganglia are covered by the capsule, a layer of connective tissue. Besides the brain and spinal cord, which form the central nervous system, other parts of the body contain neurons that form the peripheral nervous system. For example, nerve ganglia are clusters of neurons located outside the central nervous system. There are several types of ganglia: sensitive, present in the cranial nerves and dorsal roots of the spinal nerves, and motor ganglia of the autonomic nervous system.